During the second part of the show, we'll be discussing the recent acquisition of Wellsphere which occured this week. Dr. Val wrote an article entitled, "How The Health Blogosphere Was Scammed." In addition, twitter has had a lot of discussion on this. You can follow the discussion with the label #wellsphere. 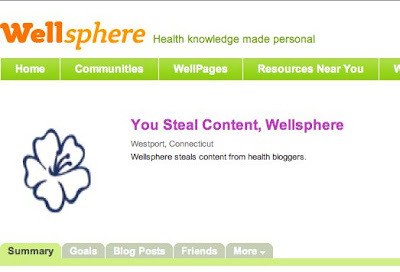 Much of the discussion surrounds medical bloggers submitting blog posts and other content to wellsphere without receiving any compensation while this company did. The frustration out there in new media medicine (ie-medical blogsosphere) is palpable. This is clearly exhibited by the screen shot below from our friend Kerri Morrone Sparling who - formerly - had content on the Wellsphere site. (Of note, the screen shot below was taken before her account was deleted) In turn, other people who used to have content on the site have changed their profiles similarly. Do you have a Wellsphere story to share? To try to get the word out to more people, I encourage you to write a blog post about it and tell your readers, your colleagues, and everyone else about this story. If you leave a link here, I'll try to gather all the stories on this blog post to let people know that this has affected a lot of people - and a lot of people out there are very mad. If you do listen live, you can even take part in the chat room. It is truly "The show within the show." You can even call in and say hello. A great opportunity to interact with medbloggers you've only read about. And, you will be able to see me on the live webcam during the show! Update: There have been some questions with regard to show 71. I will try to address some of them here. I did talk a little about the situation on show 72. So, I encourage you to listen to the latter part of that show. As I stated there, I do not intend to release the second part of the show. Sorry for the inconvenience. As far as the first part of the show, in the near future, I do intend to release the portion of the show with Doctor V from the blog "Parenting Solved" and author of the book "Colic Solved." That segment of the show also featured Dr. Gwenn from the website "Pediatrics Now." With all the frauds out on the net, has it occurred to the medical community to lobby for an ending such as dot med like dot com, dot gov, etc. You couldn't get an address without passing a screening board of some sort. It would really help the general public. Prevent colds? Go To Bed! Nationwide Cell Phone Ban While Driving?